The Imperium of Man is broken. It prostrates itself to a dead god and smiles as it dies from within. Those beings who see its fall cry out. They try to show the fools another path, a way beyond the scripture of the dead god and towards those who have lived when humanity was still young. These prophets are shunned and imprisoned, their words silenced with either key or bullet. But, what happens if the warp chooses to help its servants. What happens when three truth seekers escape their confinement and show the followers of the inquisition that those who refuse to see the light, must be burned by the darkness. 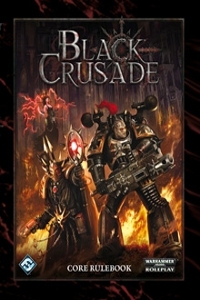 Black Crusade is published by Fantasy Flight Games. Support Fandible by purchasing through one of the links below.